Brand new. 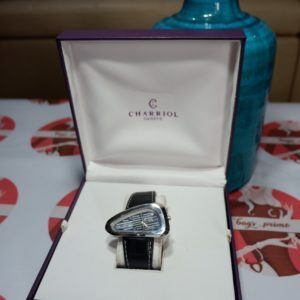 Authentic Charriol Geneva Silver No. 1894 Black face. Swiss made. Charriol Geneve St. Tropez 30mm Bronze. Mother of Pearl face. Excellent condition. Authentic Charriol My Darling Silver Watch. Pink Mother of Pearl face. Brand new. Authentic Charriol Silver Rotonde Watch No. 2067. Mother of Pearl face. Brand new. Authentic Charriol St. Tropez Silver Watch. Mother of Pearl face. Excellent condition. Authentic Charriol St. Tropez two tone Black face with crystals. Excellent condition. Authentic Charriol St. Tropez Two tone Mother of Pearl face with crystals. Charriol St. Tropez two tone Mother of Pearl face with crystals.